Wishes during the holidays from friends includes fantastic dives and amazing moments underwater for the coming year but more than just traveling to exciting dive sites I planned and getting blasts underwater, I reaffirm my responsibility for the environment and reinforce my vows for the marine world. There are a lot of things divers and other ocean lovers can do to help protect and preserve the beloved ocean. But there are things not to do, some simple things we can, day to day to help. Here are five things to digress for a healthier ocean, these are nothing new actually and are not hard to do. Healthy water environment is free from litters! Bring canvas bags to the grocery store and say no to plastic. Plastic waste is one of the most prevalent threats to the ocean today. Look for items with less packaging and recycle as much as possible. Don’t use plastic ware or paper plates. I cringed watching food chains’ daily dumps at the land fill, so horrible. I can only wish that every local authorities shall ban use of plastics. Last night was a victory as I refuse packing the fruits I bought in a plastic bag from a street stand. Nothing grand but if it becomes a habit being conscious everyday will eventually eliminate plastic wastes. Hopefully. Don’t litter. This is kind of a no brainer and most people who enjoy the outdoors in any capacity follow the “leave nothing but footprints” or, in the case of scuba divers, “leave nothing but bubbles” rule. Leave No Trace should always be our policy! I always bring a nylon trash bag during my dives to collect garbage and do a quick clean up before leaving the beach. We can do this even when we trek or hike. Don’t buy coral or other harvested souvenirs when traveling. 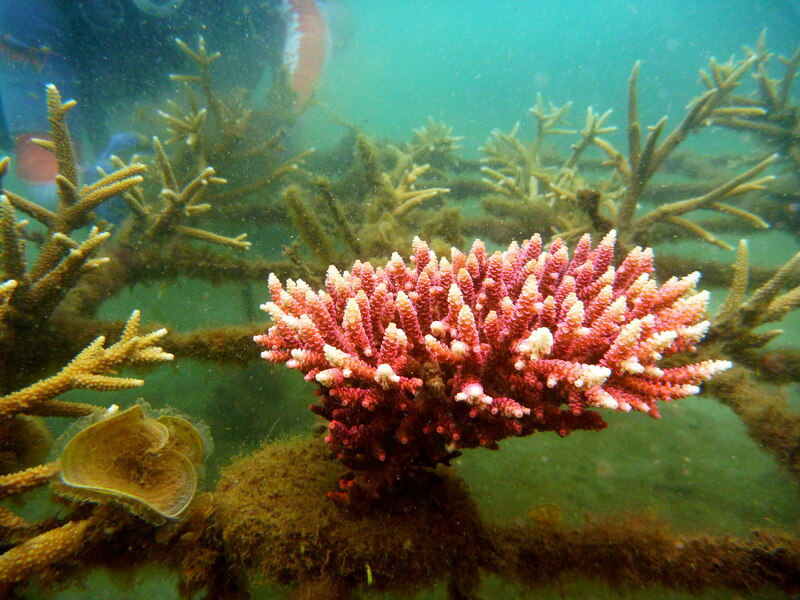 Pieces of coral are most likely broken off living reefs, causing damage that can take years to rebuild. Instead, take pictures of the beautiful corals and shelled animals you encounter while diving. This makes a memory for you yet still leaves the ecosystem intact for the next diver to enjoy. Use care when choosing your sun protection. Many commercial sunscreens contain chemicals that wash off into the water which cause negative physiological changes in the environment, and therefore, the marine life within. But not to worry — there are plenty of “reef safe” products available to protect yourself from the sun’s damaging rays and treat any overexposure. Choose a lotion or spray with organic ingredients as possible, my favorite Sohoton cove prohibits sunscreen when you visit the Jellyfish Lagoon! As we start this year anew, we need to change our ways! Nursery that propagates corals – pink corals, anyone? Many local government units (LGUs) maintained nurseries, in agriculture parlance nurseries are where we nurture seedlings which shall later planted in its appointed time and appropriate area. It could be fruit trees seedlings, vegetable seedlings, flower and the like. 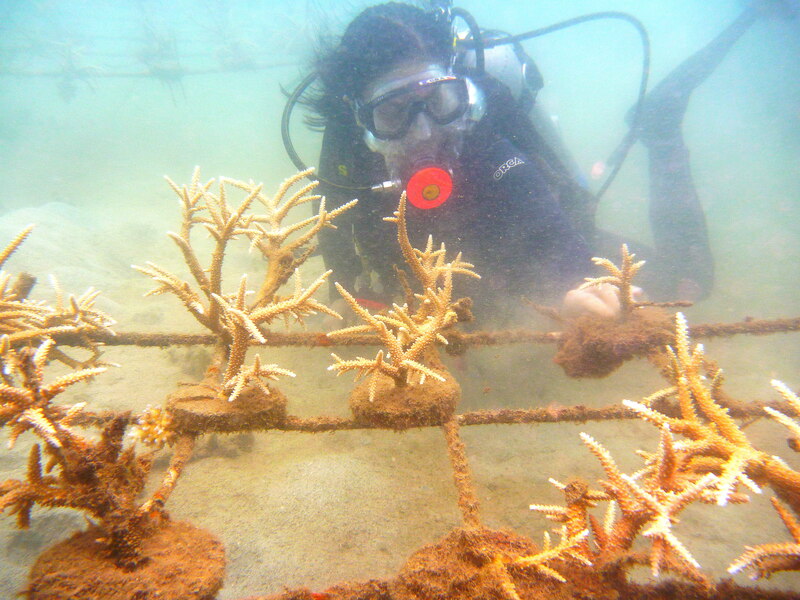 In the waters, to preserve the reefs and provide shelter for the degrading marine life, many have adopted coral transplantation. Just like planting on the surface, selected seedlings are necessary to be nurtured and for this purpose that would need a coral nursery. Legaspi City is one the few local government units that installed and maintained one. It is a formidable task for the LGU alone, so in partnership with BFAR, BU, MCCF and Pacific Blue they established the facility. Last year, the brief encounter with Mr. Jin Masuda of Pacific Blue who was too optimistic on the success of the restoration efforts was too encouraging. For me, the importance of protecting and preserving marine resources can not be undermined. I just thought, this nursery is worthy for a visit! Pacific Blue was kind enough to arrange one for me for free, the ICRM office was just beside the dive shop and I had a good chance in meeting the sea patrol unit. Legaspi City is one of the few who are serious in the fishery law enforcement in their territorial waters which I found too interesting. I had a long surface interval discussing their activities, plans, difficulties, challenges as well as victories. Coral seedlings are branching out! We trooped to the west end of the boulevard, took the ICRM boat donated by AECID and had my third descent for the day enjoying the afternoon warm flat waters, I was bit excited what to find in the depths. It was only at 9 meters on a sandy area, it wasn’t long when we found the crates of the seedlings. Their technology is different from the Linamon Project but all the same, the seedlings are allowed to grow first before the transplantation. 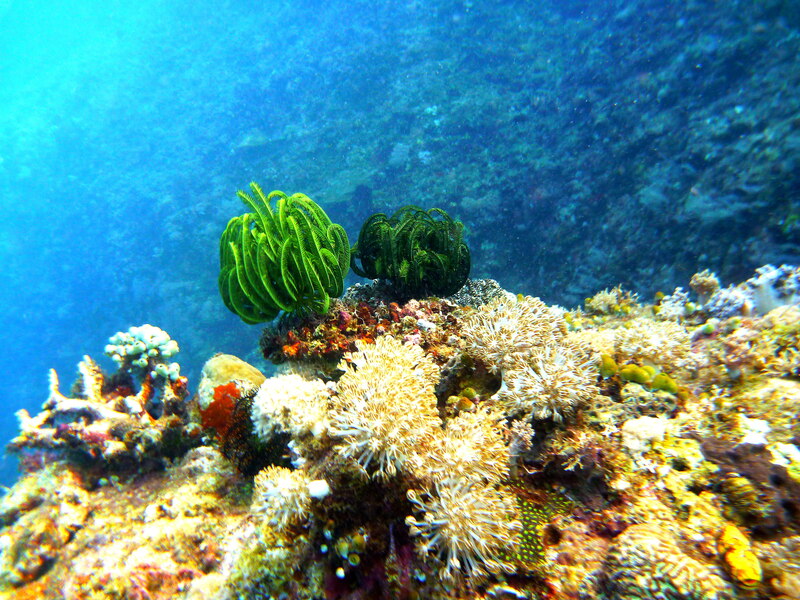 The corals are sourced out in the nearby for adaptability advantages. My two companions – Ato of ICRM and Jun of Pacific Blue got instantly busy. Cleaning, arranging and inspecting the crates. They went around from end to end, later they told me they were searching for thatone missing crate which I had no idea while down there. We found it like 20 meters away from its original location. 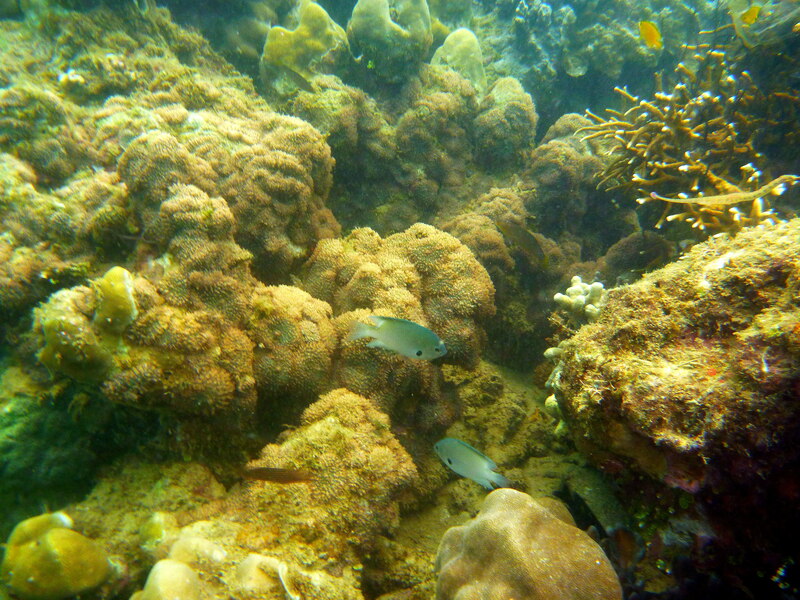 The newly transplanted corals in the area thrive well and juvenile fishes were roaming around. Newly transplanted coral from nursery, obviously healthy! After 40 minutes of going around we ascend, it wasn’t really long (I could have stayed longer I still have much air) but what a great privilege to be one of the few who witnessed such uncommon but very beneficial project for the marine world. Mr. Masuda is right, in five years Albay Gulf would be carrying in its bosom a colorful, active, rich and productive reefs. The home of Mt. Mayon is more than just its alluring surface, something is more fascinating in its depths! Cleanup Ideas for World Oceans Day! Cleanups are a great way to bring people together and enact actual change for the local environment. But what can you do with a beach clean up to make it unique? Well for starters you don’t have to clean up a beach! Here are 6 quick ideas for holding a cleanup on World Oceans Day – or anytime you want to do something for your community. Click here if you’d like to download a full-length aquatic clean up guide. Got the chance to watch the film during Cine Europa 17, with the festival’s theme focusing on family and relationships, it was a surprise to me. The only documentary among sixteen (16) films shown in Cagayan de Oro leg. Can we explain to everyone, the greatest natural mystery of our planet? Can we help our children believe in a better and more sustainable world tomorrow? These were aptly addressed in a beautiful array of underwater life and scenery. It narrates the most marvelous and also the most terrifying human experiences of our time. More than the marvelous blue planet and its current condition, it is a plea for humanity to respect the world in which we live. A call to protect the entire ecosystem – surface and depths – being relatively connected in the universe. It is time to imagine international stewardship of the ocean, and to believe that we can all react in time. 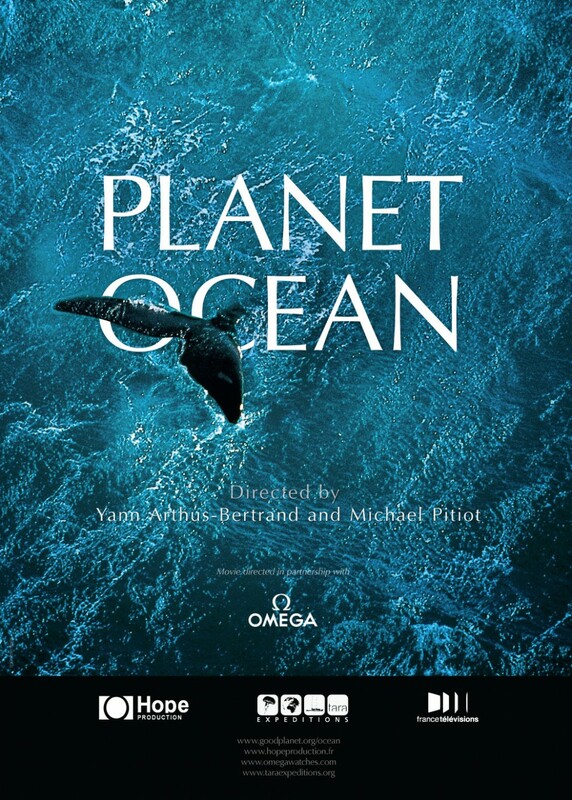 The message is that we can still change direction to remain in our Ocean Planet. 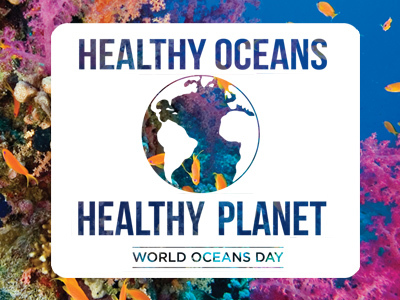 The call is to protect 20% of the Ocean by 2020! STOP SUBSIDIES FOR INDUSTRIAL FISHING! ONLY BUY FISH WITH ECO-LABELS! ESTABLISH TREATY FOR THE ARCTIC! Albay Gulf is a promising dive destination and I was fortunate to learn that there is an ongoing restoration works on damages due to dynamite fishing. My brief encounter with Mr. Jin Masuda, the Japanese director of Pacific Blue have raised hopes, that the surrounding waters in the region would flourish and its resources more productive, in due time the most could be five years. The diveshop in coordination with BFAR, BU, MCCF and other groups collaborated on coral transplantation and restoration, it is a formidable task but he was optimistic that the works would largely improve the marine environment in the gulf. The documentation showed the growing transplanted branching corals and juvenile tropical fishes that started to multiply in the area. For sure, the cooperation of fisherfolks in the coastal communities would be necessary for its success. In recognition to the growing importance of responsible and sustainable tourism, Misibis Bay too has pledged its commitment to protect the environment and to improve the livelihood of the local community through its Misibis Bay Coastal Care Foundation (MCCF), a non-profit organization launched in 2009 dedicated to the implementation of various conservation projects like coastal and underwater clean-ups, giant clam planting to promote coral reef growth, solid waste management, and monitoring and prevention of illegal fishing. Unknowingly our side trip to Misibis Bay the next day gave me the chance to dip in the waters, but not diving – it was too expensive I cringed as I inquired for the rates! Snorkeling was allowed for free, three other workmates signed up to join me. The resort has established a marine sanctuary as an added attraction of its properties. The skies were downcast but we were in high spirits for a swim, we were in good mode as we rolled off for the diveshop. The facility was off the coast near a patch of beach at the far end of the cove. We descend as it started to drizzle, our guide was insistent that life vest is a requirement as we snorkel. We were not disappointed – giant groupers, snappers, parrotfishes, sweetlips, rabbitfishes and more tropical species swarmed near the shelter. 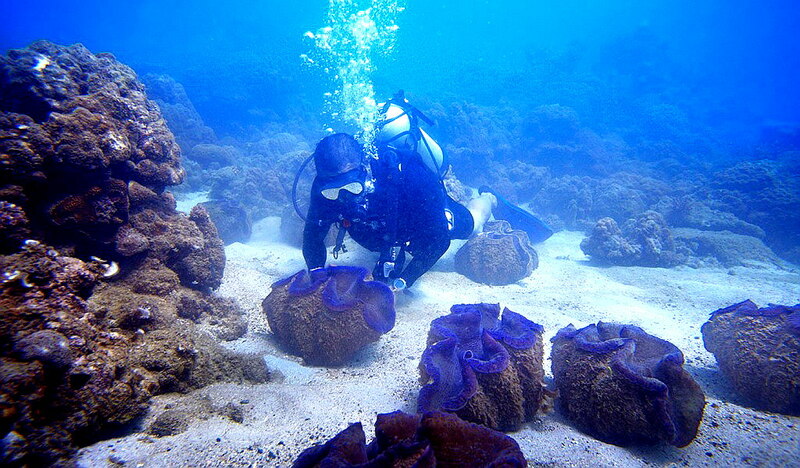 The guide pointed few of the giant clams gone a stray, he said more of its population were seeded in the deeper part. So diving in the area will include the viewing of the giant clams, unfortunately the rain started to pour we were not able to swim further. My companions suggested to end our swim as the rains continued pouring and the waters getting colder. With this development no doubt the region is a potential as a new diving destination in the future, its attractions more than just on the surface but beyond, in its mysterious depths! The choices we made reflect more of who we are, far more than our brains, skills and abilities…..
Our impact on land is important just as in depths, our choices as human beings has effects either blatantly or subtly. Years back, I was struck realizing that marine world is in great peril, the value of the reefs can never be underestimated. Human induced global warming now poses perhaps the most serious threat of all, the evidence is very visible. Before it leads to extinction, protection and preservation are all necessary with consuming effort by humanity. Do I really need that car journey? Do I really need all those plastic bags at the supermarket? Do I need to fly as often as I like? Do I really need products with all those packaging? Do I need to change towels everyday? Do I need all these dust-gatherers in my room? Do I need to indulge in the bath tub weekly? Basic and simple questions that need simple but radical decisions and change of lifestyle, indeed conservation starts at Home. By this time, I believe many are getting the message. It’s not something new, and many are seriously involved now more than just marine enthusiasts. Clover’s book, “The End of the Line”, stated that citizens need to reclaim their stake in the future of the seas. Do I need to dive weekly or monthly? Do I need to take advantage of airline seat sales? For almost five months I had no dives, I was like a fish out of water! I knew that my presence underwater has ill effects though subtly, it was difficult but that break provides space for my underwater friends. My presence is not necessary for them to survive, in fact it poses danger to them. I haven’t flown for almost three months and my travels were limited to work that can’t be delegated. These “low cost” airfares are misnomer, actually there’s a great cost and we are all going to pay for it whether we fly or not. Take this, flying to Maldives emits tons of carbon dioxide, an effective way in helping to sink them. With that reality, I can not visit this marine paradise and explore its wonders if only to make them afloat a little longer. All my plane fare now includes WWF donation to compensate for my carbon- emitting flight. A diver like me needs to rethink about limiting trips, and reducing ecological footprints. As the saying goes, a true ecotourist never get on a plane! Just mid of last week I had dinner with friends, trying this new food chain in town – the seafood is great according to them. Maybe, it was filled with people when we got there. But I was aghast of the plastics they use – from plastic gloves (eat with fingers), plastic bibs or apron (it’s messy), camote fries was on wax paper, and the worst was – our one (1) pound hot shrimps with garlic/butter sauce was in clear plastic (food grade I hope) tied on its top end, delivered to us like a bag of groceries! I can not imagine the bulk of plastic garbage they dumped everyday in the land fill, most likely tons – it was disgusting! I know I have no good reason to be back in that resto. Seriously, if we need to make a difference, difficult decisions has to be made. I believe that the greatest wisdom is being able to master the things that enslave us – our passions, desires and wasteful habits that tries to consume us but we can be free and rise above all of these, all for that greater love and passion of the great beyond.